When doing a MINI Countryman vs. Nissan Juke comparison, consumers will notice many similarities including vehicle dimensions, safety features, and the suggested sticker price. However, there are a few key differences that discriminating buyers will want to take notice of. Both the Countryman and Juke are approximately 162 inches in length, 70 inches in width, and just over 61 inches in height. The stocky appearance of both vehicles suggests a comfortable interior cabin with plenty of head and legroom. The Juke excels in front passenger legroom with about two more inches than the Countryman, while the Countryman has approximately five more cubic feet of total interior cargo space. One drawback with the Juke is that it has only 10.5 cubic feet or cargo space behind the rear seats. This is smaller than many hatchback models. Both vehicles have a lift-gate rear cargo door. 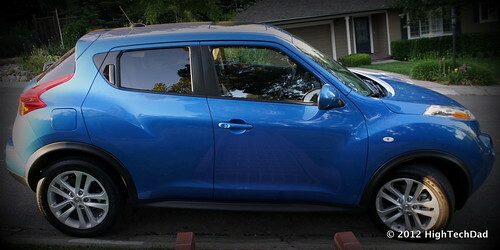 The Countryman features perimeter approach lights and roof rails, both of which are lacking on the Juke. The Juke has chrome accents on the front grille and auto-off exterior light controls. Both of these models come with halogen headlamps, power exterior mirrors, and an integrated roof antenna as part of the standard equipment package. Both the Juke and Countryman are powered by an in-line, 4-cylinder engine with a displacement of 1.6 liters. The inter-cooled turbo on the Juke results in a great discrepancy in horsepower, however. The Juke delivers a total of 188 horsepower and 177 lb.-ft. of torque at 2,000rpm, compared to just 121 horsepower and 114 lb.-ft. of torque at 4,250rpm on the Countryman. Buyers opting for the Countryman S will get power comparable to the Juke but will pay a higher sticker price of several thousand dollars more. The Nissan Juke has a six-speed manual transmission with all-wheel drive trims coming standard with a continuously variable automatic transmission. 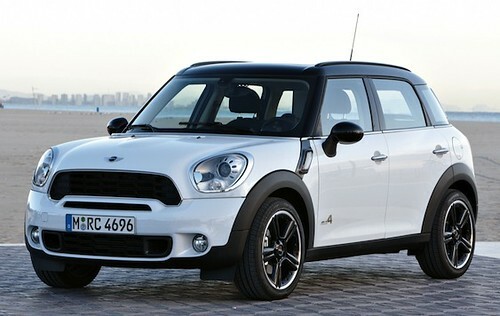 The MINI Countryman’s engine is coupled to a 6-speed manual with an optional six-speed automatic transmission. Both models feature standard front wheel drive with an all-wheel drive option. However, it should be noted all-wheel drive is only available in the more expensive Countryman S ALL4 trim. With front wheel drive, the Nissan Juke averages 32-mpg highway, compared to 35-mpg on the less powerful Countryman. A number of the interior amenities are identical on both the Nissan Juke and MINI Countryman. These include manual air conditioning systems, cabin air filter, power front and rear windows, steering wheel-mounted cruise control, manual front seat adjustments, and analog instrumentation display. The seating configuration is slightly different, and Nissan advertises their model as a 5-seater as opposed to the 4-passenger Countryman. The Countryman has a telescopic steering wheel, illuminated driver and front passenger mirrors, leatherette seat material, and a full driver information center. The Juke does not come standard with any of these amenities but does feature 60/40 split-folding seats, an in-radio display clock, and an engine temperature gauge. Both vehicles have illuminated entry, fixed reading lights, low fuel monitor, and an advanced tire pressure monitoring system. Both the Nissan Juke and MINI Countryman have a six-airbag system that offers protection in both front- and side-impact collisions. Impact beams are found in the passenger doors of both models. The modern and innovative traction control system found on most of today’s passenger vehicles are part of the standard equipment list on the base trim of both the Juke and Countryman. Both vehicles have a security and anti-theft system available, and the Countryman boasts a pre-wired system on the base trim. Brake assist and 4-wheel ABS is also standard on both models. The Nissan Juke carries a 3-year, 36,000-mile basic warranty and a 5-year, 60,000-mile warranty on the powertrain. The Countryman carries a 4-year bumper-to-bumper warranty and a 4-year, 50,000-mile warranty on the engine and transmission. The suggested retail price is nearly identical, about $21,700 for either model. In concluding this MINI Countryman vs. Nissan Juke comparison, ultimately the decision comes down to styling preferences and how much of a priority performance and price is. If you want power on a reasonable budget, go with the Juke. But if you love the MINI’s styling, comparable power can be had in the Countryman S, but at a significantly higher price.